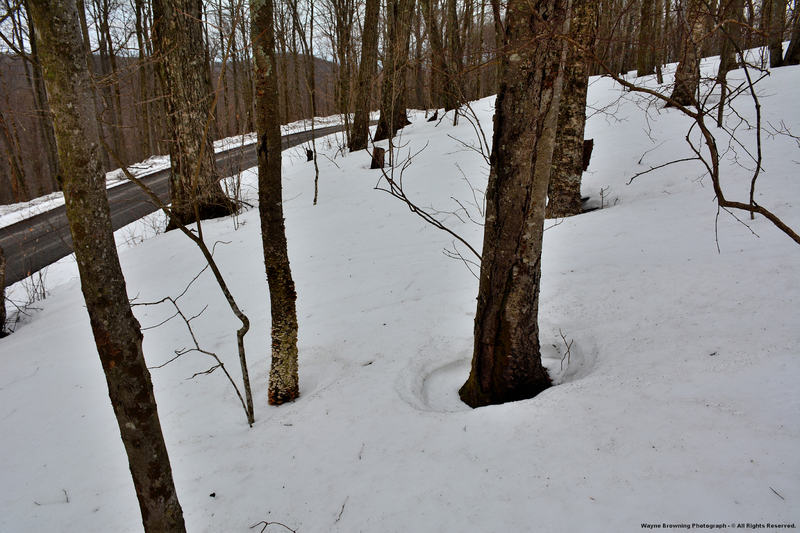 Water from heavy rain running down trees had melted rings around tree bases throughout the northern woods, which had been wind blasted with many tiny fragments visible in the snowpack from strong wind speeds of recent days. 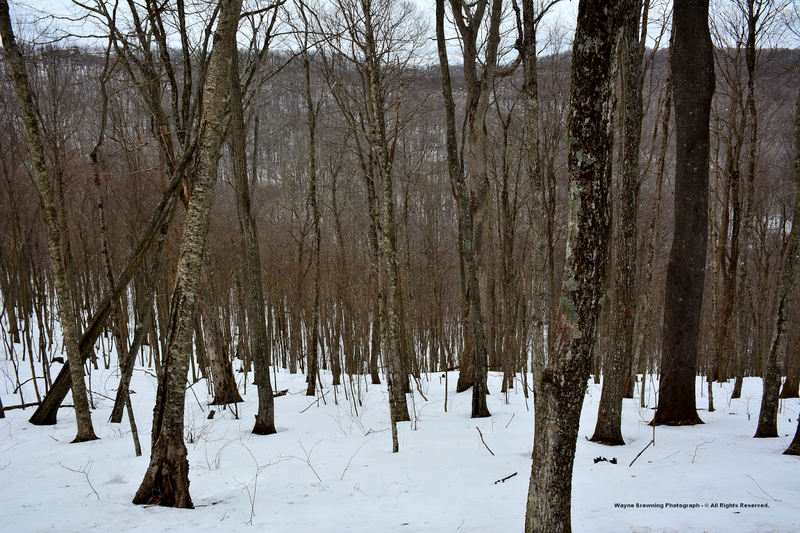 A general 10" to 15" of snow depth, with 18" to 30" in places, remained across northern exposed slopes of the High Knob Massif in wake of extensive flooding during the first week of March 2015. This was a true snowpack with bottom snow from January 2015 lingering amid the high country of this great massif. Snow was packed so hard that I could walk on top of up to 30" of depth without breaking through, at least in places. ( largely rain ) during March 1-6 and loss of up to 30" or more of total snow depth. 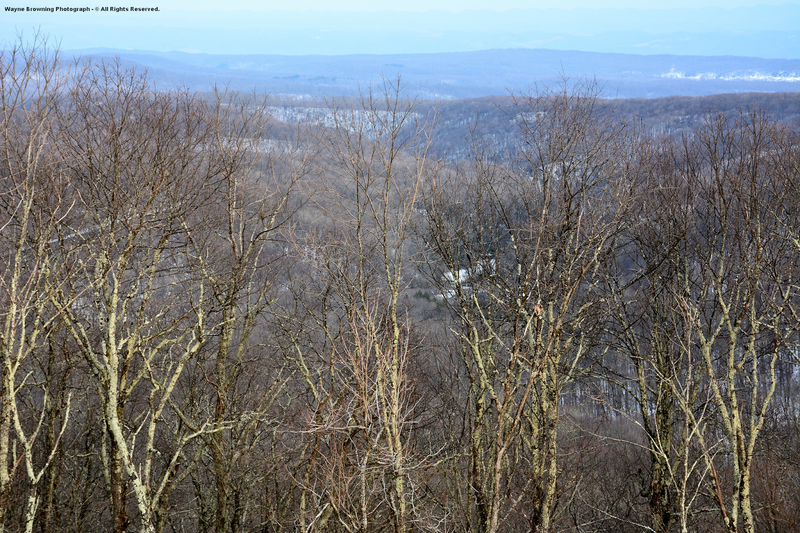 The snow depth loss by afternoon of March 9, from near MAX depths reached late on February 21 into February 22, can be illustrated by these images from Eagle Knob. 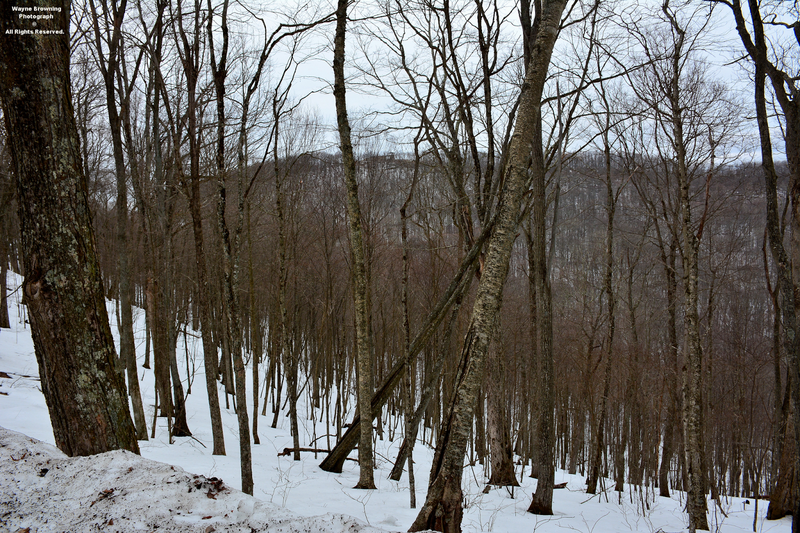 These images from my friend Cody Blankenbecler illustrate how much snow had already disappeared on Eagle Knob by the time I measured snow depths during March 9 ( around 30" of depth had melted at snow markers on Eagle Knob ). 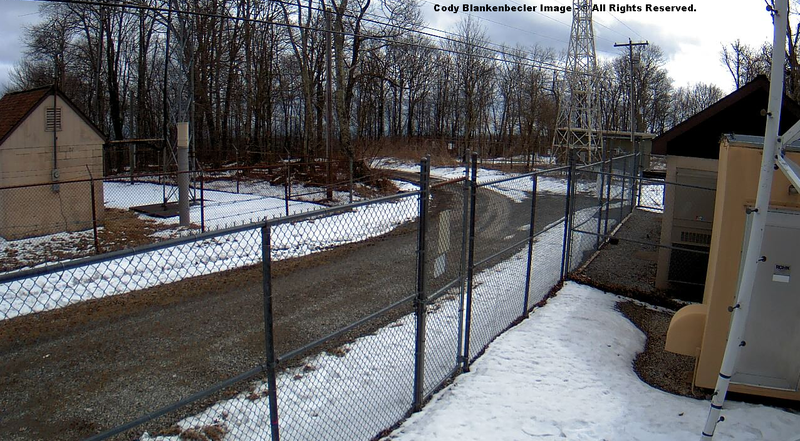 Note how depths change along the chain-link fence by clicking back and forth in the picture viewer. ( locally much more in deep areas ). This was a tenacious snowpack and one of the most difficult to fully melt away that I had seen in years, likely due to its layered development over time and high water content. A generalized snowpack profile from the end of February, that I made of the snowpack in Clintwood, was applicable to the deeper, wetter snow in the High Knob Massif. 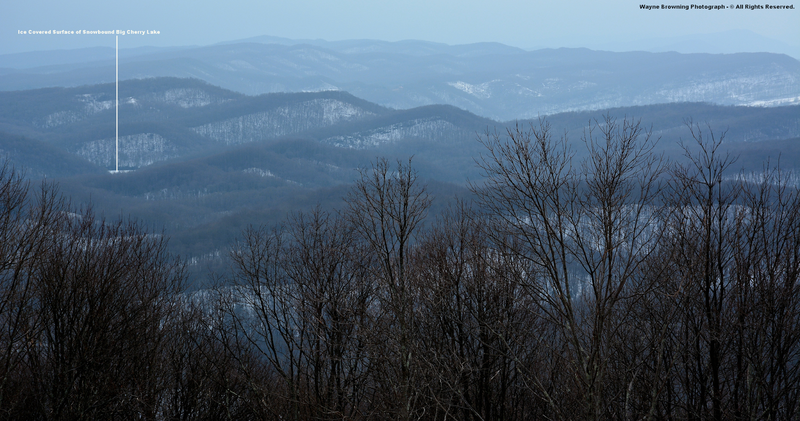 The widespread nature of the snowpack left on March 9 was clearly visible from the new High Knob Lookout Tower. 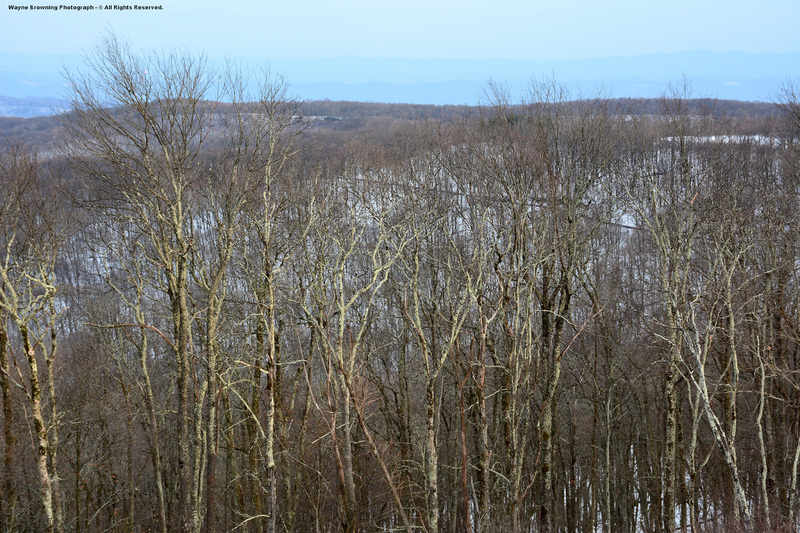 The ice covered surface of High Knob Lake is partially visible near center of the above photograph, with a small section of ice covered Big Cherry Lake shown in a picture below. 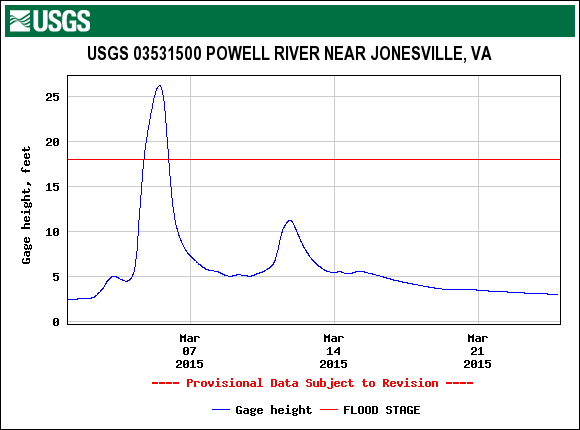 March 9 was amid the great melt down period with high water volume on steep creeks draining the massif for days following this time as snow melted slowly ( thankfully ) and more rain fell to push creeks to near or locally above flood stage again. 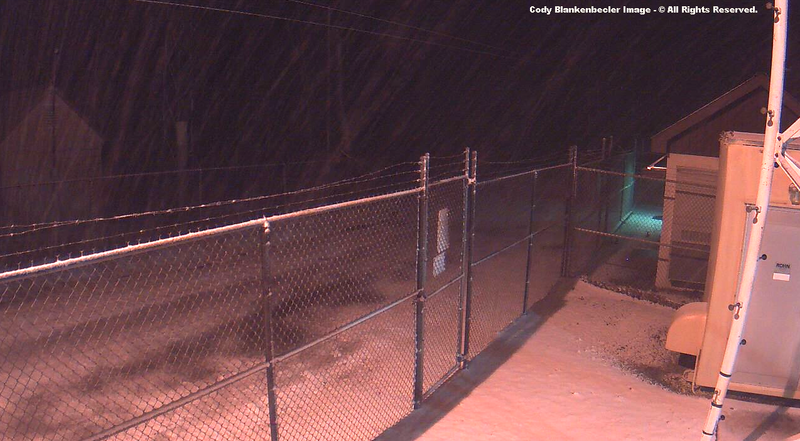 The NWS Forecast Office In Morristown, Tn., made the wrong call by not issuing a flood watch for all this snow melt, with water around homes in the Tacoma area and in other places along creeks draining the massif during March 10-11. A flood watch was properly issued in advance for the significant flooding observed during early March, which was an excellent call by the MRX NWSFO. *If creeks do not need watching then a Flood Watch or Flash Flood Watch is not needed. If creeks need to be watched by residents, then clearly a watch is needed. 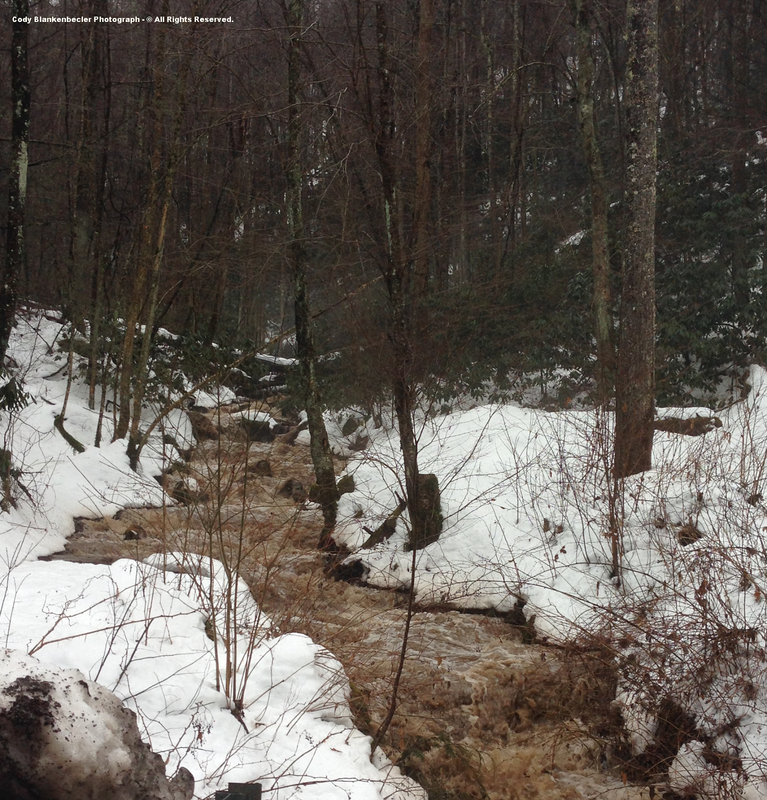 In this case, there was no question that creeks needed to be closely watched in Wise, northern Scott & Lee counties. 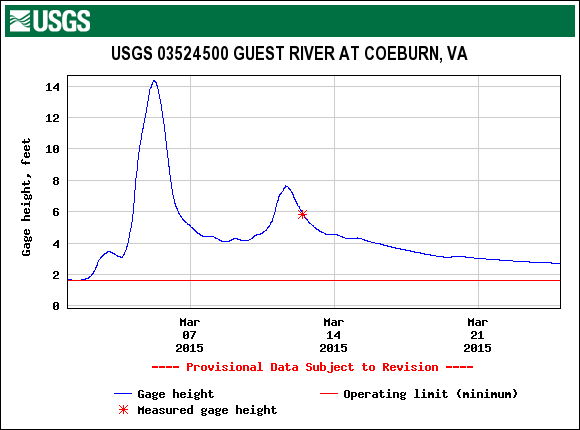 Main-stem rivers remained well below flood stage during this secondary run-off period when it was headwater creeks that rose to within a foot or less of flood stage. When levels on steep creeks draining the massif reach those shown above they ROAR and are so loud that you can not hear somebody talking standing right beside you. It is a very powerful experience to witness and I encourage anyone who has not observed these creeks, at or above the "Red Alert" level, to do so. There are many more creeks. 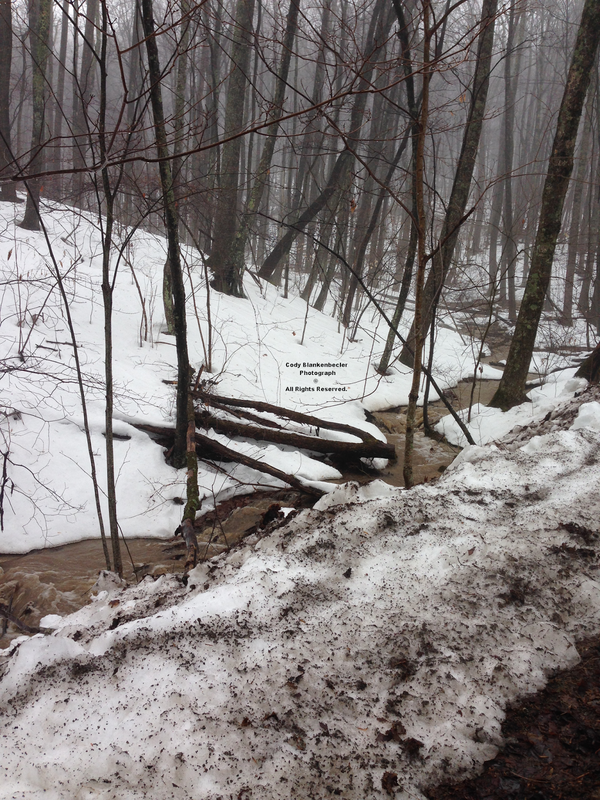 While most do not have a stream gauge like Big Stony Creek, it can be used as a general guide for the other steep creeks, especially during the cold season. During summer the possibility of localized downpours in thunderstorms can cause large flow volume differences between adjacent creek basins. 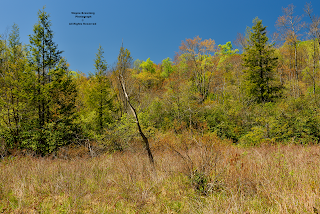 The High Knob Massif is unique in that most major creeks are lake and/or wetland controlled to some extent, with locally significant subterranean conduits retaining much more water. many cave systems that are part of a complex hydrology. 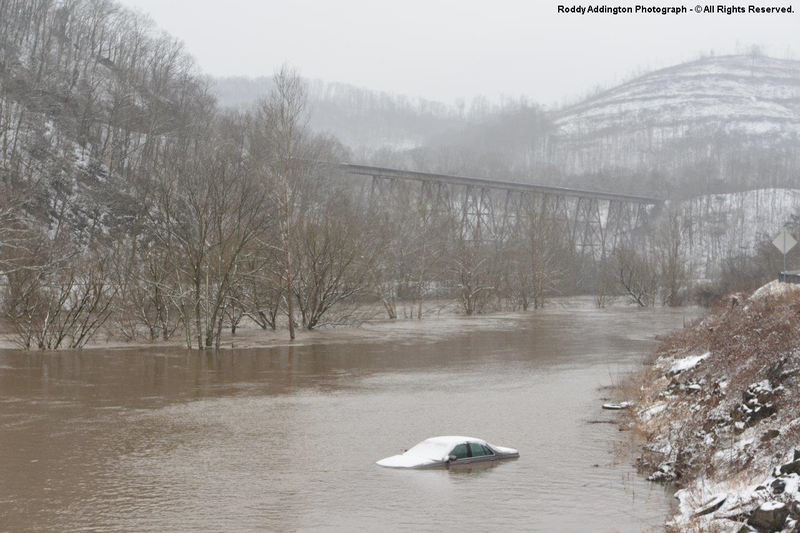 Any area will flood, and certainly that was the case during early March when heavy rain combined with significant loss of snow to generate extensive flooding, rock-mud slides in the area. It was a great blessing that deep snow remained and did not all melt away during the early March flooding or it would have been much worse across Wise, Scott, Lee counties. More than 65 roads were closed in Wise, Scott, Lee, and Dickenson counties during early March. 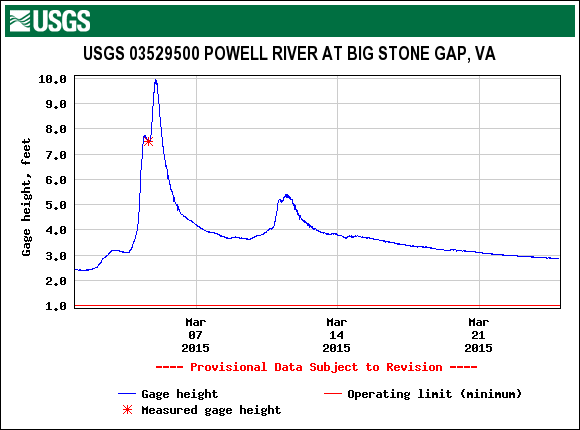 Flooding of low-lying areas in the East Stone Gap-Big Stone Gap area typically begins when the river stage reaches 5.0 to 6.0 feet, with water around many homes during this early March episode. Photograph by Cody Blankenbecler - © All Rights Reserved. The photograph above was taken by Cody near the Flag Rock level, with the scene below at the base of the massif near the City of Norton Water Plant. The City of Norton rests upon a divide with water shown above flowing into the Powell River while water flowing off the massif east of Benges Branch, and the Norton Reservoir system, goes into the Guest River of the Clinch River. With exception of January 2015, its been a wet orographic forcing season in the High Knob Massif area with abundant precipitation. 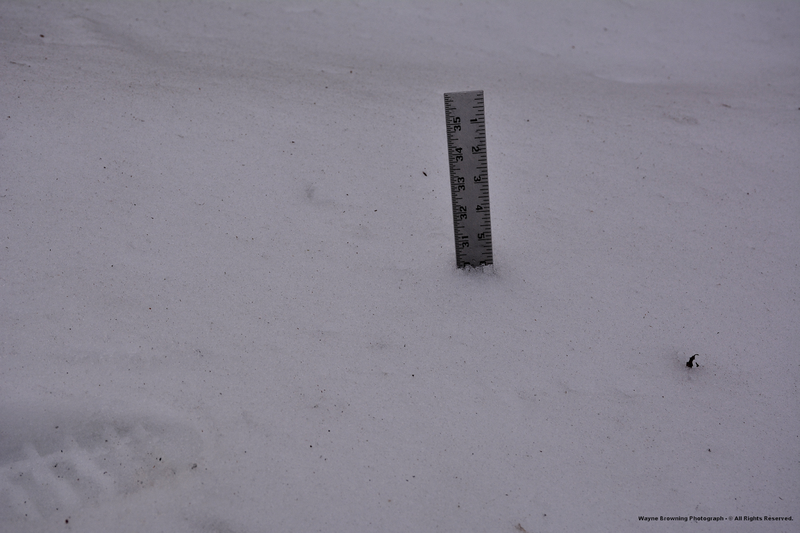 January 1-March 16 Total: 17.79"
October 1-March 16 Total: 36.75"
of precipitation falling as snow above 3000 feet. 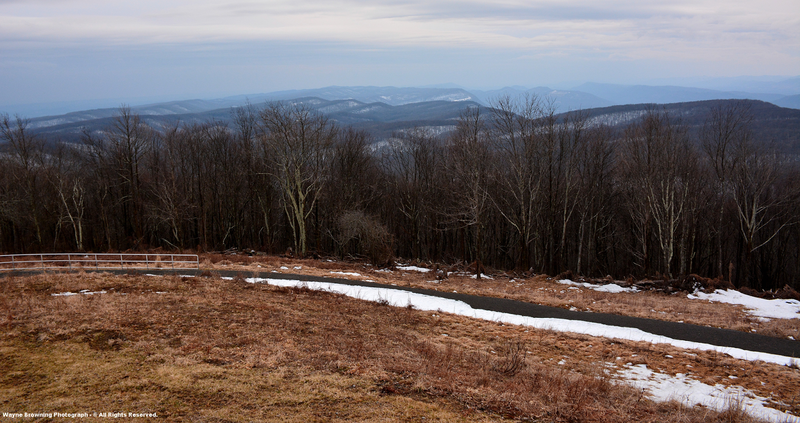 Although I knew the High Knob Massif area had gotten the most snow in Virginia, as is common, even I was somewhat surprised upon recently catching up with climate data that anomalous dryness had been ruling locations to the east in southwestern and central Virginia. Highlighting some of these extraordinary precipitation differences across southwestern Virginia ( and the state in general ) is one of the reasons I started this website back in Summer 2009, since most folks ( public & professional ) were not aware of these differences which are climatologically common. There was some flooding in Wise County during February 21-22 with stopped up storm drains and so much snow that water could not run off roads. *Big Cherry Dam has missing data due to evaporation between hand-measurements which average 1 per week, and losses due to winter snowfall ( the February total being based upon snow core data ). on the crestline amid upper left of photograph in far distance. 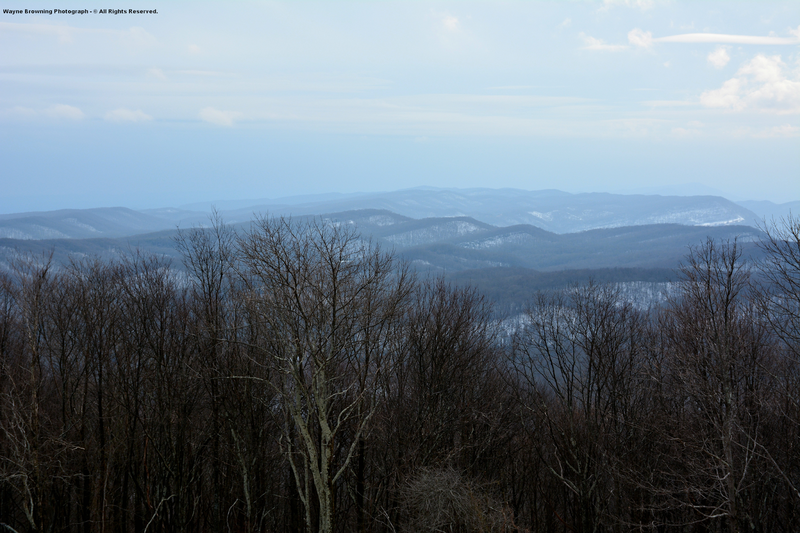 If you are a lover of extreme weather changes then the High Knob Massif was the place for you during March 26, with billowing clouds that gave way to downpours in thunderstorms followed by a change to wind driven snow ( within several hours! ). 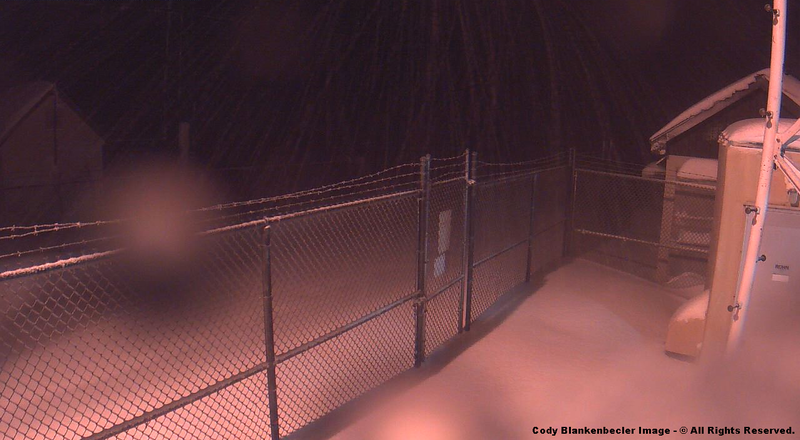 Around 3" or more of snow accumulated at the summit level by morning hours of March 27 ( 0.32" of water release on Eagle Knob ), with sticking from around the Norton Reservoirs upward in elevation. ( with wind chills to -10 below zero in gusts ). *Storm event precipitation totals ( water equivalent ) reached 1.50" at the City of Norton Water Plant, with 1.92" reported at the Lower Norton Reservoir. This pushed the March 2015 precipitation total to 8.39" at the City of Norton WP ( 17.18" in 2015 ), with a general 8.00" to 10.00" of March precip amid the High Knob Massif area. official 8"-diameter National Weather Service rain gauge.